When I say homemade Twix bars, I do so only because I want you to have a frame of reference. These are infinitely better for a few reasons: 1) The caramel to cookie ratio is skewed further in favor of a luscious homemade caramel based not only on the standard milk, sugar and butter, but also on sweetened condensed milk and golden syrup. 2) The cookie base is an easy press-in affair of butter, wonderful butter. 3) And the whole thing is spread lightly with bittersweet chocolate that gives easily to the teeth before they meet a bit of carmelly resistance. And homemade Twix bars seem to endlessly reinvent themselves. Straight from the refrigerator, they are solid and chewy, the carmel yielding only as you work it around a little. Left out on a platter they become meltingly soft, even gooey. They fill the mouth rather than fight it. I like them both ways, but am perhaps a bit more addicted when they are room temperature. If you decide to give them a try, you'll have plenty to decide for yourself. With a rack in the lowest portion of the oven, preheat to 350. Spray a 9x13" baking pan with cooking spray, line with parchment paper, then spray the paper. In a stand mixer with the paddle attachment, or with a hand mixer, cream the butter and sugar together on medium speed for about 2 minutes. It should be fluffy. Gradually add in the flour and the rice until the dough comes together. Press the dough into the bottom of the prepared pan and bake for 12 minutes. Rotate the pan and continue to bake for another 8 minutes. The shortbread should be a deep golden brown. Cool on a rack to room temperature, still in the pan. In a large saucepan, stir together the sugar, syrup, water and lemon juice. Wet the sides of the pan with a little water if any of the ingredients have crept up. Cover the saucepan and cook it over medium heat for 4 minutes. Remove the lid, increase the heat and bring the mixture to a boil. Do not stir. The mixture will bubble, and if sugar appears on the sides of the pan, brush them back down with a wet pastry brush. The bubbles will continue to get larger. In the meantime, bring the heavy cream to a boil in a small saucepan. Remove from the heat and set aside. Return the saucepan to medium heat and stir constantly until the caramel reaches 240. Pour over the shortbread and allow to set. In a double boiler or in the microwave set on half strength, melt the chocolate and butter. Stir until smooth. 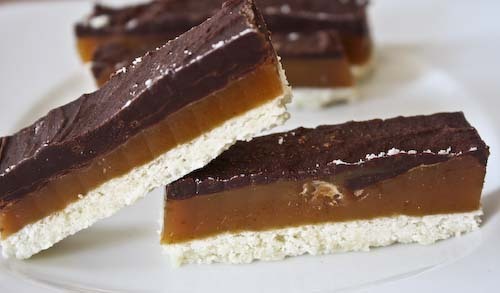 Pour evenly over the caramel and let sit at room temperature or in the refrigerator until set. * Ms. Yard uses this technique for making caramel (I assume) to avoid having to stand over the stove stirring the entire time. Milk burns easily, which is why it's added at the end and why the stirring occurs after it's added. If you're careless like I was and dump all of the ingredients together at the same time, all is not lost, but you will have to stir the entire time, until the mixture reaches the 240 mark. * For some reason, I didn't find bittersweet chocolate and used semisweet instead. No harm done. * UPDATE: For ground rice, simply put dry rice into a food processor and grind away until you have a fine powder. Then pass through a sieve to get any chunks out, process one more time, and measure out 2 tablespoons. 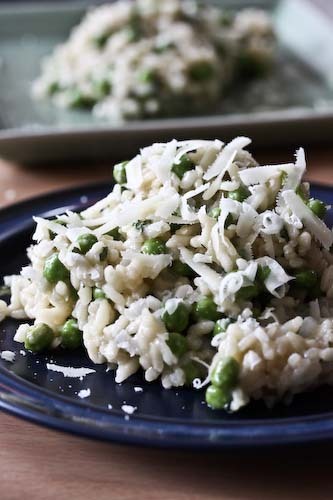 Ground rice is NOT the same thing as rice flour, so don't substitute. 1 million times better than the original "Twix" bar! ohhh yum! it is probably a very bad thing i found your page because twix bars are my fav and i'm sure these will not last long in my house!!! If forced to eat a candy bar (and it wouldn't really be forcing me! ), I would eat a Twix. They are the perfect combo in my book. I think I know what's on deck for next week's treat! We call this millionaires shortbread in the UK. 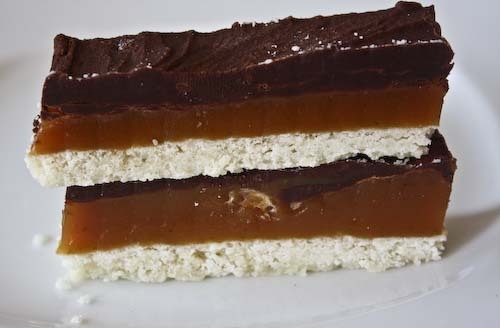 Yours look especially good, I love the thick layer of caramel, that's the best bit! I heart Twix bars..Now I can make them! I love Twix, but I don't let myself eat them anymore because of the ingredients. I am so going to have to make these sometime! I just discovered that my "corner store" sells Lyle's! Oh Andrea, this look sinfully delicious. Would you send some over to me? My mouth water just to look at your photograph. this look fabulous!!! I used to love Twix bars and these look even better! Could you elaborate on the ground rice part? Do you buy it pre-ground, like flour? Or do you do it yourself? If you do it yourself,is the rice raw or cooked? I would love to make these, but the rice threw me off! These look fantastic. I'll have to give them a try. I love the fact that the caramel (the best part) takes up most of the bar. Thanks for the recipe. This sounds sooo good. I found you on tastespotting. Awesome blog, and those homemade twix. I can't wait to make them. These look so impressive! I love twix bars, they're definitely one of my favorites. Thanks for the ground rice update! These look amazing! I'm not crazy about a lot of candy bars, but Twix is (are?) the exception. I could eat Twix every day, I think. I can't wait to try these! I haven't had a Twix in probably 10 years. This sounds so good and "school lunchish." Thanks for sharing! I just found your blog and I adore it... just so you know. Looking forward to seeing more. They look way too good. Possibly even dangerous! ooo, i love this idea, it looks great. i bet a peanut butter twix version would be tasty as well. any one have any ideas/suggestions for a golden syrup substitute? i'm living in asia at the moment and don't have easy access to it. i guess you could just do a regular caramel? Looks like that will have to wait until next week! Wow! these looks too good. Natalie, they're one of my favorites as well. These are just about as bad for you, too! Chrissy, I know you do. Dana, let me know if you like them! Sam, really? I love that name! Maya, ha ha, yes you can! Esi, nice corner store! I have to take the subway to get it! Carolyn, we polished them off the two of us in record time! And we barely shared. Elra, I wish I could, but they were gone before they were posted! Flutterbyblue, they were a childhood favorite of mine as well! Cookingmom, I've updated the post for yoU! Manger La Ville, thanks for stopping by and for the kind words! Sara, they're time consuming, but not that hard really. But they do take some time! Bensbaby, I hope you like them if you try them! Hayley, actually, I don't know the last time I had twix either. It's been a while! Eileen, you're so sweet! Thank you so much! Annie, actually I think dangerous is a good description, they're addicting! Chic Cookies, thanks so much! I'm flattered! k8inorbit, hum, could you get light corn syrup or something like that? That would work too. Ben, looks like I'll have to wait for next year! I'm no good at staying off the sweet stuff. Thanks Hillary, let me know if you try them! That looks insane. home made Twix bars - pure class. Well,i´m highly dissapointed, was hoping for real homemade twix bars, but jeez, doesn´t evne slightly resemble it!